Most of the full-page pictures are divided into two or more panels. Here four panels present, from top left, God sending the angel Gabriel with the message of the incarnation to Mary, the annunciation to the Virgin Mary, the visitation (Elizabeth, Mary's cousin and mother of John the Baptist, greets the Virgin, revealing she knows she bears the son of God), and the nativity or birth of Christ. 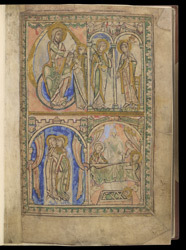 The captions at the top, in Anglo-Norman French, were probably added a bit after the psalter was finished.